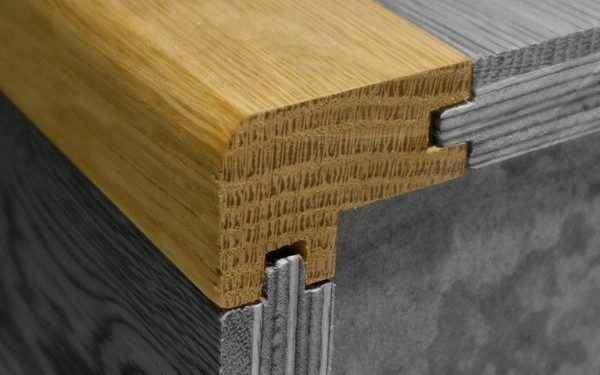 Mouldings are often overlooked once they’ve been fitted and usually even an afterthought during the buying process, but they are a vital element of any wood flooring installation. Not only do they serve an aesthetic purpose, mouldings allow us to have vital expansion gaps. These 10-15mm gaps give the flooring space to move as it expands and contracts with fluctuating humidity levels. In the absence of these gaps, the pressure against the flooring can cause a whole range of structural issues and without mouldings, these unsightly gaps would be on show for all to see. So, we know they’re essential, but which mouldings do you need to buy? In this guide for the sake of ease, we’ll split the mouldings into three categories; Perimeter Mouldings, Door Thresholds and Other. As the name suggests these are mouldings that go round the perimeter of a room. Their purpose is to cover to the expansion gap and provide a neat finish where the wood flooring meets the walls. On the whole, the moulding you choose here is personal preference. The most common is either Skirting Board or Scotia. We’re all familiar with Skirting Board. These are decorative pieces that protect the bottoms of walls in almost all homes with or without wood flooring. However, with a wood flooring installation, the Skirting Board serves an additional purpose in allowing an expansion gap as well as pinning the flooring down at the edges of the room. If your flooring is correctly installed, you shouldn’t have issues with the flooring lifting anyway, but it just gives that extra peace of mind with floated floors. 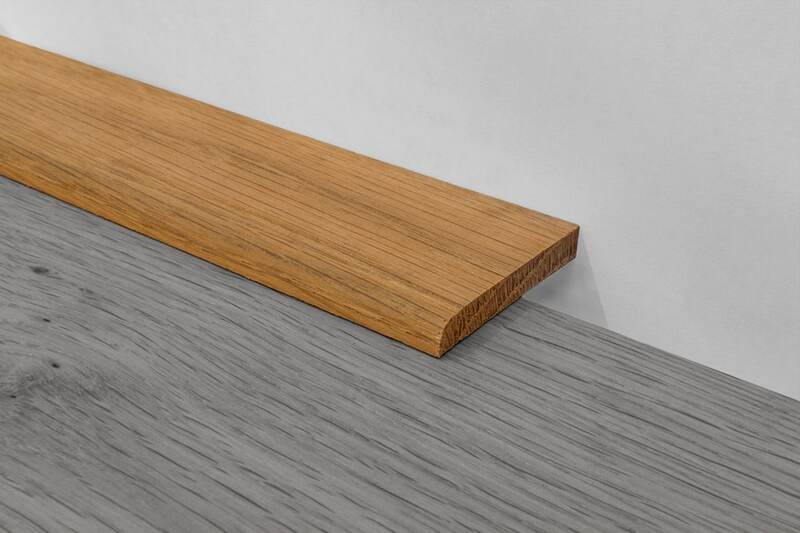 Skirting Board also provides the cleanest finish of any moulding as we’re so accustomed to seeing it, we don’t give it a second thought. It’s a more popular solution for new builds/renovations where you don’t have to remove existing skirting. 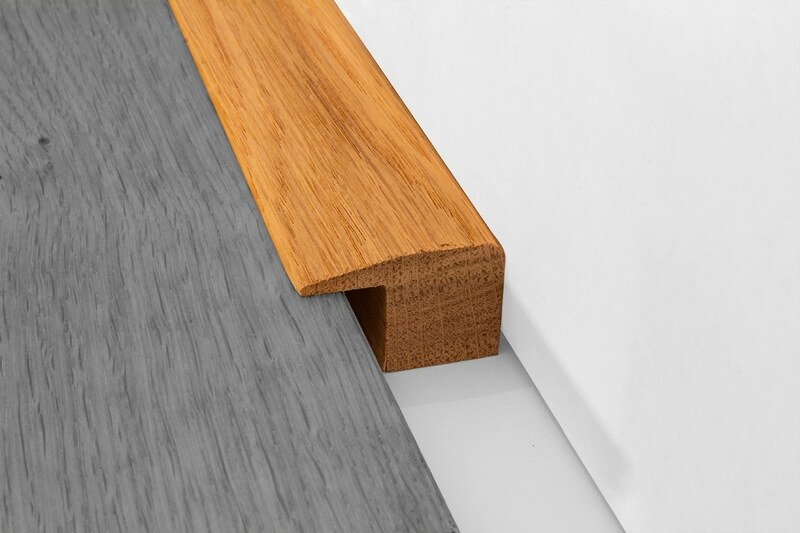 If you’re not working with a new build or complete renovation, chances are you already have skirting board in place. This means you have to go to the trouble of removing and refitting the skirting even just to raise it a few millimetres to allow the flooring underneath. It’s not unusual for skirting to crack and split or even damage the walls when being removed. Therefore, a lot of people opt for the less labour intensive solution of Scotia. Second only to Skirting Board, Scotia is arguably the least intrusive option. 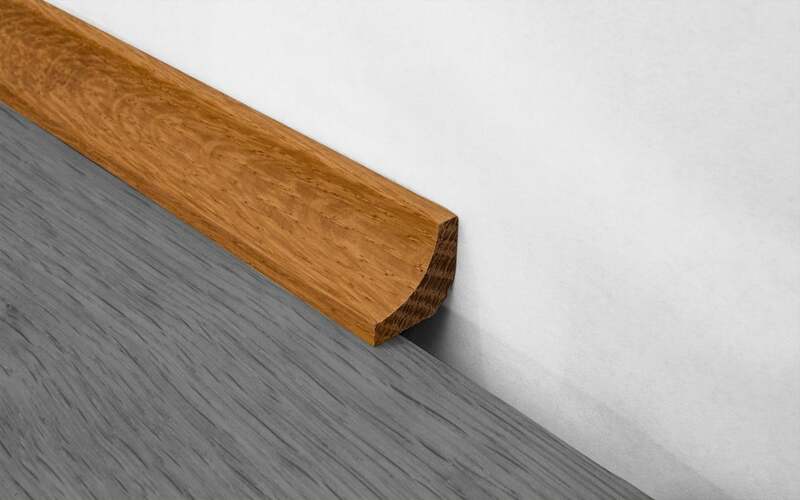 Used in conjunction with the existing Skirting, it’s often the most cost-effective way to finish the perimeter of a room. 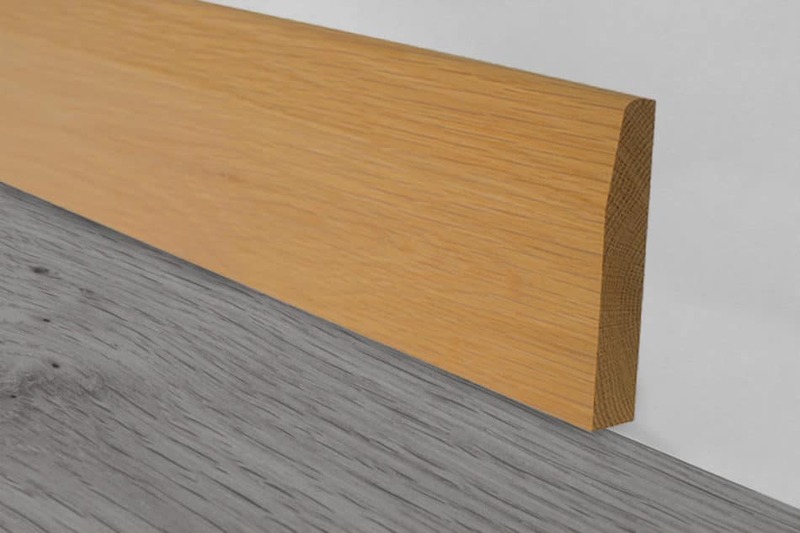 As you can see from the image below, the Scotia’s small profile doesn’t catch the eye, particularly if you colour match it to your wood flooring. Functionally, it’s similar to Skirting Board. 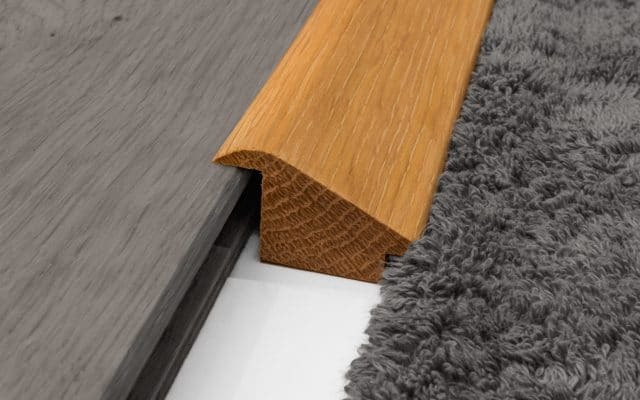 It hides the expansion gap and applies downward pressure that helps to prevent the floor lifting at the edges. When installing Scotia with Panel Pins, cut the head off of one of the nails and use it to drill pilot holes in the Scotia. This stops the sometimes delicate Scotia from splitting! 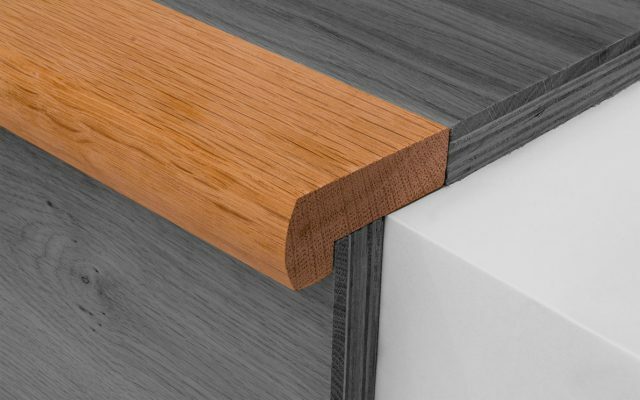 From the cheapest option to potentially the most expensive, a Square Edge or End Section, is a solid piece that again is usually used in conjunction with existing Skirting. This more conspicuous perimeter trim is generally used to surround mat wells or fireplaces than an entire room. However, this is mostly only because of the extra cost, as a Square Edge perimeter does provide a neat border that is very easy on the eyes. 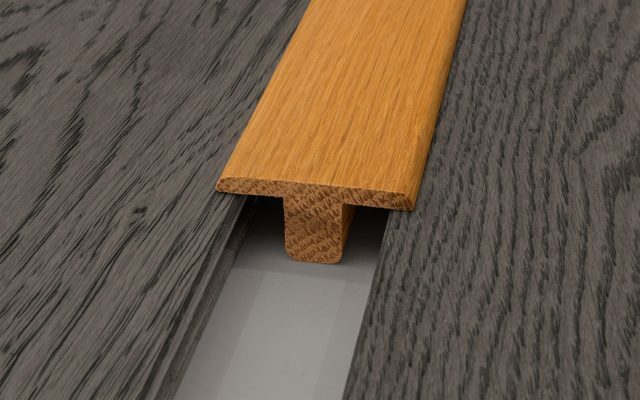 As with Skirting Board and Scotia, the trim provides cover for the expansion gap while also having the added benefit of holding down the flooring. Square Edges are often colour matched to your flooring, but a contrasting colour can work well too. A Flat Bead or Cover Strip frames the flooring in a very similar way to a Square Edge. The main difference here is cost and the functionality. Whereas all the other trims we’ve looked at so far stick to the wall and or floor, Cover Strips only stick to the flooring itself. 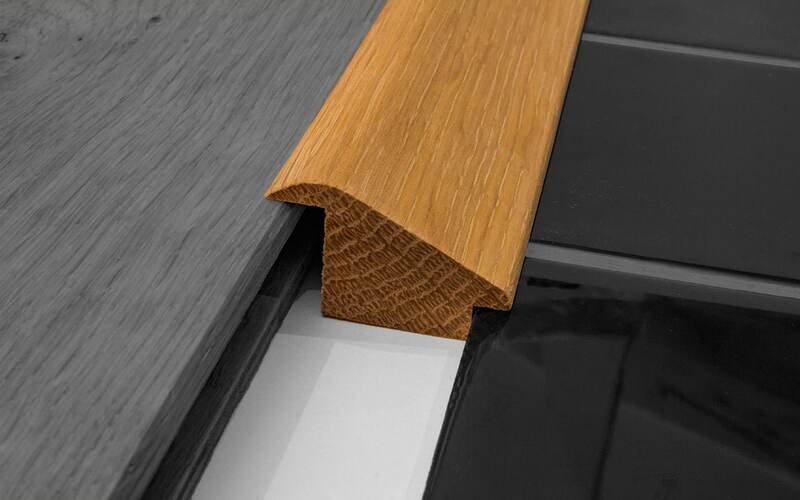 While usually a carefully designed self-adhesive backing still allows the flooring to expand and contract as required, Cover Strips don’t provide quite the same level of support as other trims. 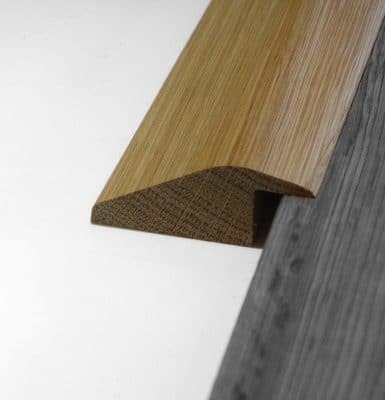 We’d usually advise only to use a Cover Strip as a perimeter trim where other mouldings are not suitable. For example, against bi-folding doors, you may find that the door frame will obstruct a Square Edge and you can’t pin the Scotia to it either. A Cover Strip in this scenario would be perfect. Door Thresholds, also known as door bars are designed to cover the expansion gap between adjoining rooms. Deciding between these trims is governed by requirements more than personal preference, as they not only cover the expansion gap but also bridge to whatever surface you may have in the adjoining room; be it lower or higher than your wood flooring. As you can see in the slides above, there are several different profiles to suit every scenario. The key to selecting the correct one is to first always look at the height of the floor in each room remebering to account for the height of the subfloor, underlay/ahdesive and then of course the flooring itself. 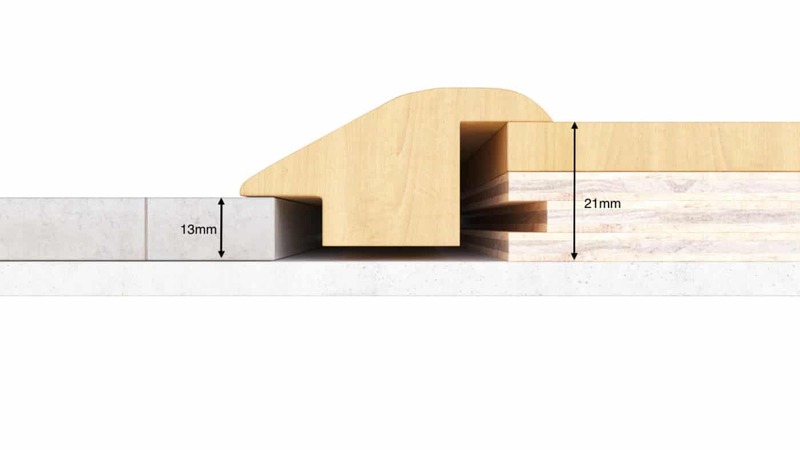 If the subfloor is level and the floors are the same height then this is easy, choose the T bar threshold and use a bead of Sika Floor adhesive, pink grip or similar builders adhesive underneath the door bar. Never glue the door profile to the wood flooring itself. This will restrict the movement of the floor and make the expansion gap superfluous. When it comes to selecting a Door Threshold for floors at different heights, it’s important to factor the difference in height above anything else. It doesn’t matter if the Threshold itself isn’t touching the subfloor. For example, imagine you have a floor in your kitchen and are installing wood flooring in the adjoining room. Now let’s say the kitchen floor is a total of 10mm and the wood flooring is a total of 18mm. 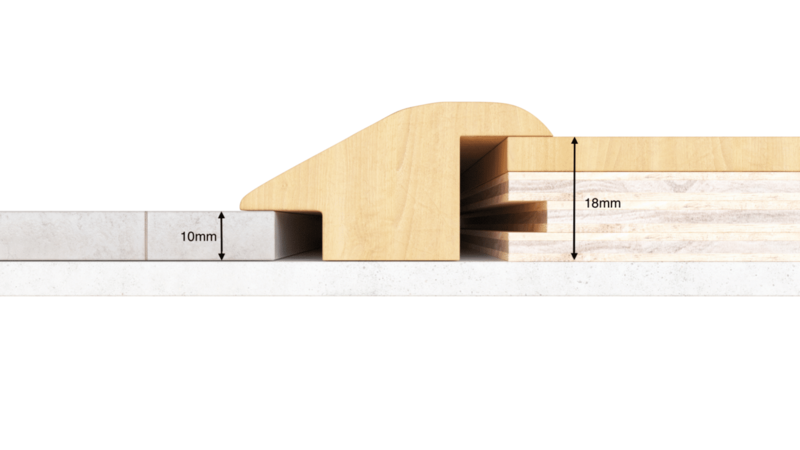 This means you need a Wood to Carpet threshold that is 18mm one side and 10mm the other, so it ramps down 8mm in total. Now let’s say the kitchen floor is 13mm and the wood floor is 21mm. Because the difference between the two floors is still 8mm, the same Wood to Carpet can be used even though both floors are much taller! The 3mm gap underneath the threshold is irrelevant and can be filled with a more generous application of adhesive. If the difference between your floors doesn’t match perfectly with the available thresholds, do not panic. They can be manipulated by your fitter and in most circumstances, you can get away with a few mm difference. Stair noses are used when you are installing wood flooring on staircases and steps. Their purpose is to provide a clean finish on the edge of a step. The difference with these is that almost all of them do not allow for an expansion gap. The reason for this is that in most cases it’s just not necessary. Firstly, because a step will usually only need one plank, so the expansion will be very minimal. Secondly, so long as there is a gap at the back of the step where it cannot be seen, the plank can expand freely as it’s not constricted by the presence of walls. In essence, stair noses just become an extension of the plank and will move with it. There are a few different designs of stair noses, but the majority of the time which you buy comes down to personal preference. Pipe covers are wooden fixtures that surround radiator pipes and other plumbing fixtures that penetrate into the floor. They’re typically much larger than the pipes themselves, so you have more than enough area to cover any cuts you had to make into the floor to get the planks in. Pipe covers are split into two pieces and held together with dowels. This provides a strong, neat fit but are very easy to install. You can get solid one piece covers for slightly cheaper, but this is only useful when you can remove existing pipework or are installing new pipes.